Cyril Colnik (American, b. Austria, 1871–1958), Hanging Basket, ca. 1900. Detail. Iron, glass; 35 x 8 x 8 in. Milwaukee Art Museum, Purchase, with funds from the American Arts Society M2012.299a–d. Photo by the author. Though the Museum’s mission is to present, in our official lingo, “four floors of over forty galleries of art with works from antiquity to the present,” I’m probably not alone among curators in getting most excited when we acquire and exhibit world-class artwork made in Milwaukee, Wisconsin. This year, I was thrilled to work with our Museum’s support group dedicated to American fine and decorative arts (the American Arts Society, or AAS) to bring to the Museum’s Collection a fantastic iron hanging basket that was designed, made, and kept in Milwaukee. While operating The Ornamental Iron Shop for over 60 years in Milwaukee, master iron artisan Cyril Colnik (American, b. Austria, 1871–1958) moved with changing fashions of his posh clientele in the finest homes of this city. It you see stunning ironwork in Milwaukee, it’s probably by Colnik. To walk on the East Side, or along Lake Drive, is to enjoy a veritable open air Colnik museum. And now, thanks to the American Arts Society, his artwork is also within the galleries of the Museum! Young Cyril Colnik studied ironwork widely in Europe. As a student at the Munich Industrial Art School, he was sent to exhibit German ironwork at Chicago’s 1893 World’s Columbian Exposition. Cyril Colnik, ca. 1890. Courtesy Villa Terrace Decorative Arts Museum. After the fair, and reputedly at the behest of Captain Frederick Pabst, instead of returning to his home in Europe, 22-year-old Colnik moved to Milwaukee and opened The Ornamental Iron Shop. 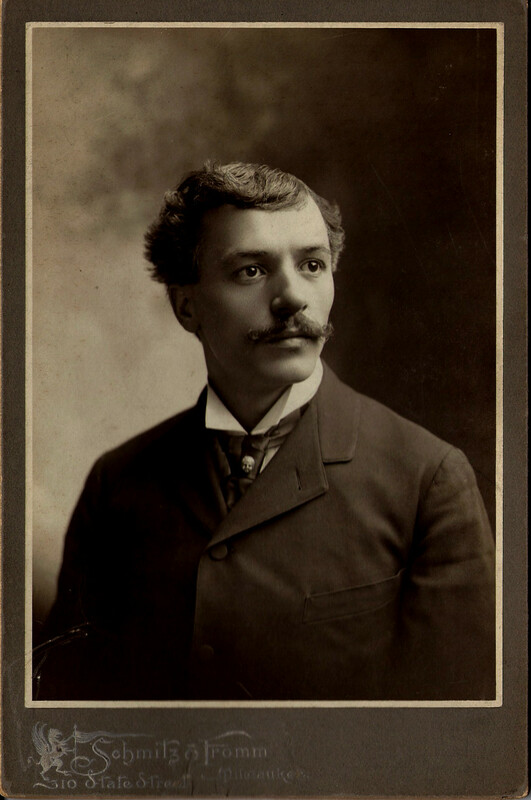 Between 1894 and his retirement in 1955, the master ironworker oversaw a shop of up to twenty-five craftsmen making an astounding variety of artistic doors, gates, balconies, grilles, candelabra, and other fixtures out of iron, brass and bronze. Milwaukee’s City Hall (1893–96), the Flemish Renaissance Revival Pabst Mansion (1892), the Italian Renaissance Villa Terrace (1923), the Classical Herman A. Uihlein House (1919), the German Renaissance Pabst Theater (1893–95), and numerous other grand buildings prominently feature his craft. 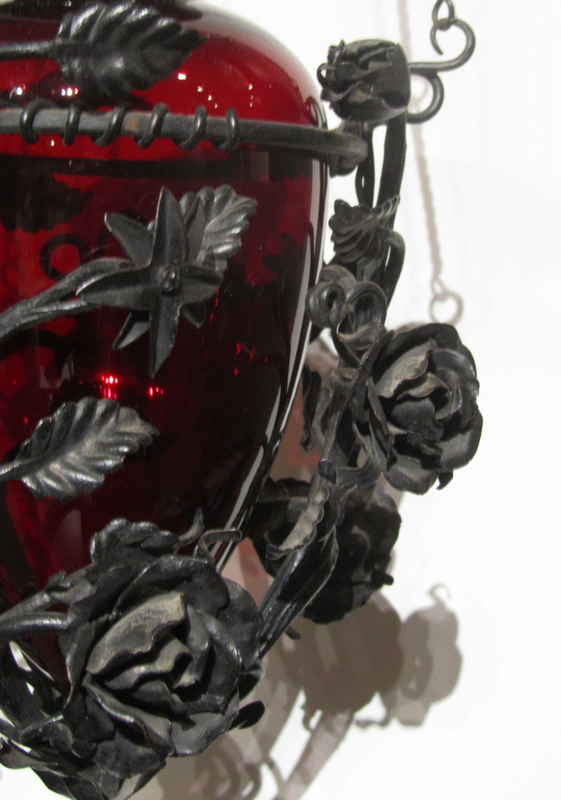 This Hanging Basket (pictured in full below) came to the Museum from a descendent of the original owners—Milwaukee’s Dr. Adelheim Bernhard (1861–1930) and Martha Steinmeyer Bernhard (1869–1912). Martha was the daughter of Milwaukee grocer William Steinmeyer, whose grocery building is extant at Highland and Third Streets and now houses the Wisconsin Cheese Mart. Martha married Dr. Bernhard, a German immigrant from Bremen, in 1898. 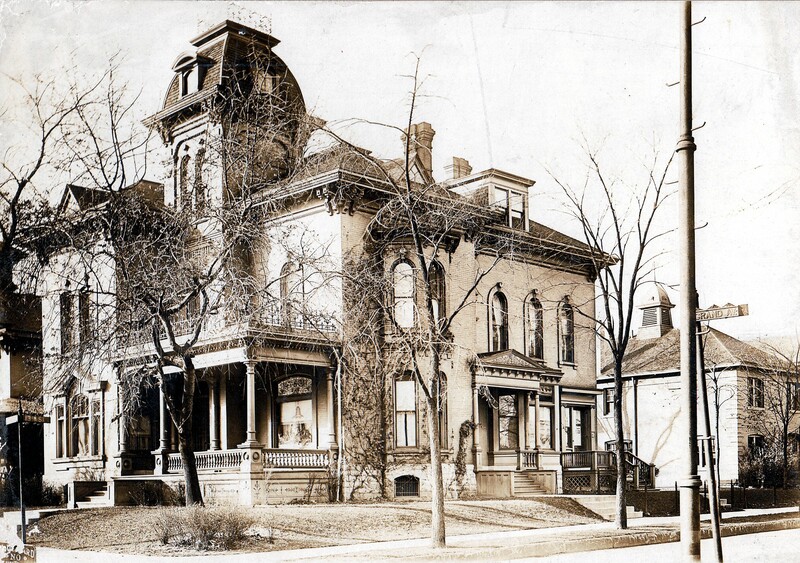 After 1904, the couple resided with their four children and household staff in the two-story brick home pictured below at 1300 Grand Avenue (now Wisconsin Avenue) in Milwaukee. The home’s location is now an empty lot on the Marquette University campus. Alonzo Matthews Residence (1300 Grand Avenue), Milwaukee, Wisconsin, ca. 1900. Courtesy Carl Backus, via The Pabst Mansion. Family stories indicate that this Cyril Colnik ironwork basket originally ornamented the home, which was destroyed around 1960. The daughter of Dr. Adelheim and Martha Bernhard inherited the house, and took the ironwork with her when she moved north to Fox Point. Since it cannot be in its original architectural surroundings, we are thrilled that this Hanging Basket is instead in the Museum to introduce Colnik’s ironwork to visitors. This example an excellent example of the fine workmanship characteristic of the artist, arguably Milwaukee’s most celebrated craftsman. 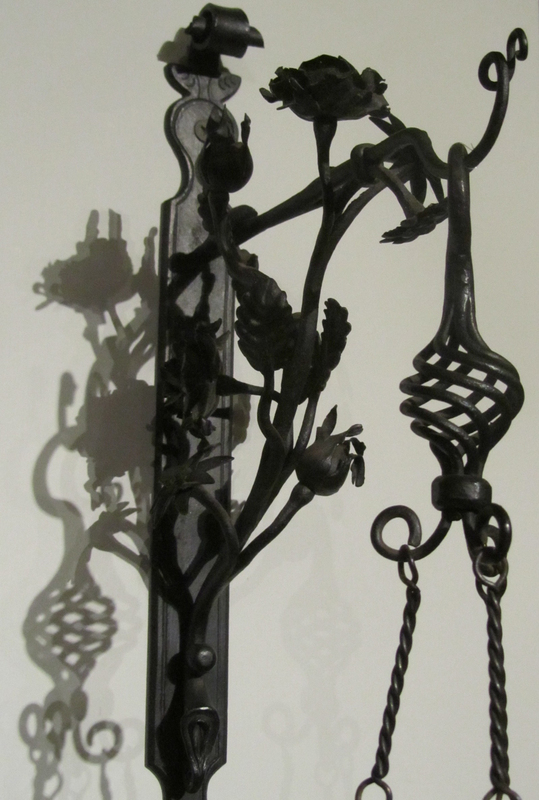 As you can see in the detail photos at top and at right, Colnik and his master craftsmen manipulated iron so finely that it curls like tissue paper at the tips of the flowers. The hanging basket is surrounded by a profusion of roses, clematis, tulips, and leaves, all executed in delicate iron, with a hanging floral finial at the bottom of the basket. A deep red glass vase rests within basket. 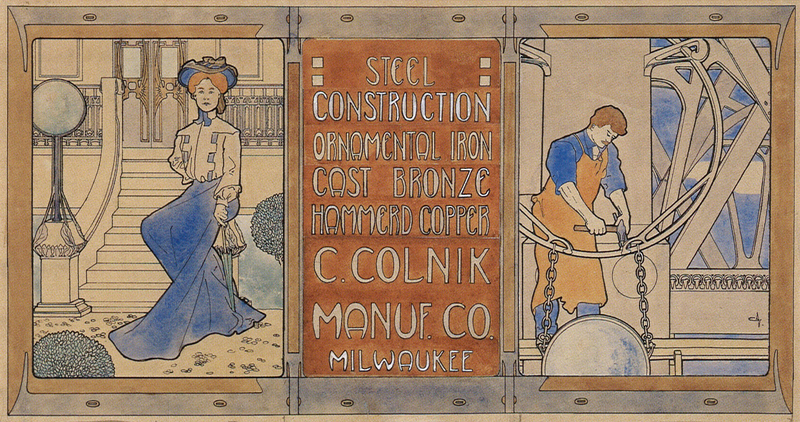 The artwork is currently on view in the American Art galleries on the Museum’s Lower Level, facing the “Chair Park.” It complements artworks by Colnik’s contemporary, Milwaukee’s interior architect George Mann Niedecken, including Niedecken’s design for a print advertisement for the C. Colnik Manufacturing Company shown right below. George Mann Niedecken (American, 1878–1945), Design for Three Panel Sign for Colnik Manufacturing Co., n.d. Ink and watercolor on paper, sheet: 12 x 22 in. Milwaukee Art Museum, Gift of Mr. & Mrs. Robert L. Jacobson, PA2007.359.1. Photo by John R. Glembin. If you’d like to see more fantastic iron, visit the Villa Terrace Decorative Arts Museum, which has more than 200 Colnik works on view in their dedicated gallery. Or, you can see many of the works online in the Wisconsin Decorative Arts database. Cyril Colnik, Hanging Basket, ca. 1900. Iron, glass; 35 x 8 x 8 in. Milwaukee Art Museum, Purchase, with funds from the American Arts Society M2012.299a–d. Photo by the author. 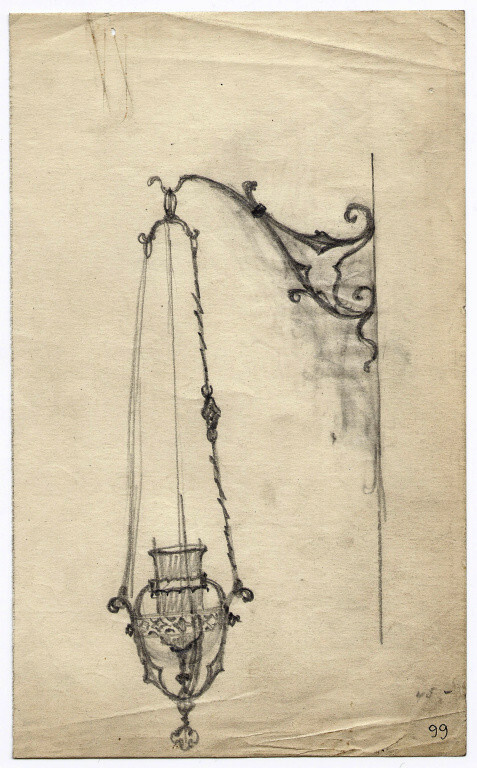 Cyril Colnik, Design for a Hanging Lamp, ca. 1895-1920. Courtesy Villa Terrace Decorative Arts Museum. Available online at the Cyril Colnik Archives database. Thank you to the American Arts Society for helping the Museum acquire this wonderful artwork–the first example of this celebrated Milwaukee craftsman’s ironwork to enter the Museum permanent collection! Also thanks to John Eastberg (AAS Board member and Milwaukee historian) for direction in this research, and to Alan J. Strekow’s Cyril Colnik: Man of Iron (Published by The Friends of Villa Terrace Decorative Arts Museum, 2011). This entry was posted in Art, Curatorial and tagged 19th century Milwaukee, acquisitions, american arts society, Captain Frederick Pabst, Cyril Colnik, George Mann Niedecken, Installation, iron, metalwork, Milwaukee, Wisconsin art, World Columbian Exposition. Bookmark the permalink. It’s gorgeous. And very exciting to have a related design drawing as well! Some reason, I feel I have to defend MU and say that they have a charming bit of green space there, not an empty lot. Would still rather have that mansion there. Love the blog & you do great work!